8942 Jetrax T6 is a BIONICLE Vehicles set released in July 2008. This set contains the Jetrax T6, a blue vehicle with turbines, three Midak Skyblasters, and a new form of Antroz. It was also released with yellow parts instead of blue parts under the same set number as a Target Exclusive. That form of it was accidentally shown in the Summer 2008 catalog. The wings can fold upward to land, and the cockpit can open up to allow Antroz to enter and exit. 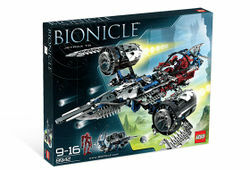 The set features many rare BIONICLE parts. The Jetrax T6 was assumedly created by the Great Beings when they created Mata Nui. It resided in the Codrex for a hundred thousand years, until the Toa Nuva discovered the great dome. It was subsequently inspected by Kopaka, and was intended for his use, until Antroz stole it. Following a chase, Antroz was destroyed and the vehicle was brought back into Kopaka's possession. This is a description taken from LEGO.com. Please do not modify it. (see an archive of the product's page) Pure power! Makuta Antroz has hijacked the Jetrax T6 and now flies it against the Toa Nuva! Open the cockpit to put him inside, then use the three powerful blasters mounted on the front to launch an attack. Jetrax T6 has 3 Midak Skyblasters that really fire! Cockpit opens and turbines fold in! Antoz stands 7" (18cm) tall! Jetrax T6 measures 21" (53cm) long and 16" (41cm) wide! A "Limited Edition" version of this set was available for a time, with the only difference to the original version being that it featured yellow parts in place of blue ones. Part:63149 appears in two sets. The alternate, limited edition version of the set. Facts about "8942 Jetrax T6"
This page was last edited on 15 August 2016, at 02:43.